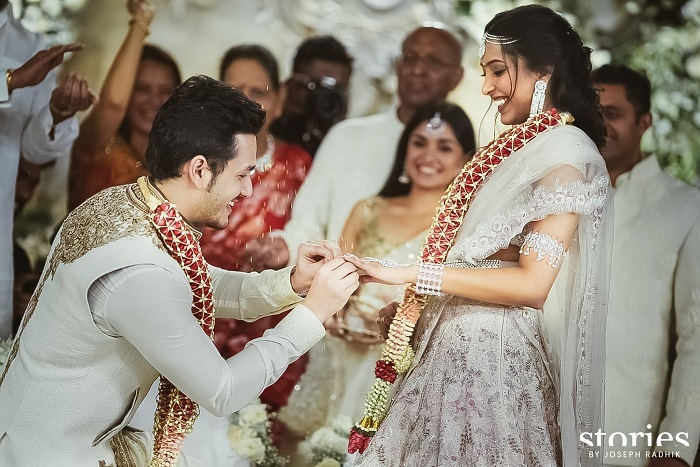 South star Nagarjunas son Akhil Akkineni got engaged to his ladylove Shriya Bhupal on Friday night.Tt was a close-knit affair at GVK House in Hyderabad.Shriya is a fashion designer based in Hyderabad and the granddaughter of business tycoon GVK Reddy. Reportedly, the couple fell in a love a few years ago, but only involved their families last year. Buzz is that they will have a grand destination wedding, most likely in Italy.Samantha, who will wed Akhil's brother Naga Chaitanya next year, took to Twitter to wish the lovebirds.